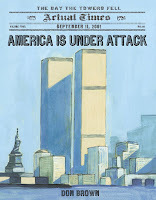 America is Under Attack: September 11, 2001: The Day the Towers Fell by Don Brown. Grades 3-6. August 2011. Unpaged. Review copy provided by my local library. We all know that life in America changed on September 11, but the fact is that many of the kids we're working with now weren't born or were too young to remember September 11. We just marked the 10-year anniversary of the September 11 attacks, so any kid under 10 years old wasn't around when it happened. They certainly have questions about it and America is Under Attack is going to provide many of the answers they're looking for. It starts with a clear blue day in September and goes on to present the events of the day chronologically. The book concentrates on the World Trade Center attacks, but Don Brown also devotes spreads to the attack on the Pentagon and United Airlines Flight 93. He describes in detail the actions of people in and around the Twin Towers at the planes hit and the towers collapsed. His illustrations put the reader inside the buildings as the plane hits and on the ground with the firefighters as they run in on rescue missions. The text matches perfectly with the illustrations, connecting the events of the attacks with real stories of everyday heroes that flow together to create one organic picture of what happened. And the beauty is that this is all done on a child-friendly level. Yes, many of the people we are introduced to did not survive (as we find out at the end), but the tragedy isn't emphasized in this tragic event. Instead, Mr. Brown emphasizes the heroic actions of regular people and how people came together to help one another that day. The book deals squarely with the events on September 11, 2001 and only an afterword gives information on the aftermath of the attacks. Mr. Brown dedicates the book to the 15 people from his hometown of Merrick, NY who lost their lives that day and he lists them by name. The book also includes a bibliography and source notes. This is an example of superb children's nonfiction and it's a great introduction for any child who's curious about what happened on that day. Read more reviews at 100 Scope Notes, The Nonfiction Detectives, and Wizards Wireless (including her 7-year-old's reaction to the book). America is Under Attack is on shelves now! Happy Nonfiction Monday! This week's roundup is over at Charlotte's Library, so go check it out!